Loved the cute and retro Fiat 500 but need something bigger? The Fiat 500X Hatchback is the grown-up version of the smash-hit vintage city car. It’s ideal for young families who need more space for the kids and toys, but who still want to be on-trend. Never has such a big car looked so cute. The 500X is a crossover through and through, blending a tall seating position with hatchback sensibilities. It’s got style, room and doesn’t cost much to keep on the road. But how well have Fiat transferred the 500’s winning formula to the big family car sector? Join OSV as we find out with our 2017 Fiat 500X Hatchback review. Fiat are the latest brand to jump on board with turbocharging tech. The result here is a bunch of highly capable engines that suit cash-conscious buyers. They all handle well, to. The steering is nice and sharp, and the body lean is well controlled by the bulky car. Refinement at high speeds is also impressive. The only real criticism we have is that ride quality isn’t as good with the larger alloys. In terms of the engines, our top pick is a turbocharged 1.4-litre MultiJet petrol engine that delivers up to 140bhp. It’s a good all-rounder that offers promising performance and relatively good running costs. Acceleration is lively, too, and goes hand in hand with the car’s sporty pretensions. There is the option of a 170bhp version of the same engine, but it’s expensive to keep on the road. It does, however, get four-wheel-drive, which improves grip and boosts driver confidence. If you prefer to make a beeline for diesel engines, you’ve got three to choose from. The entry-level 1.3-litre MultiJet unit kicks things off, with its 95bhp and good fuel economy. However, we don’t think it offers enough power and shove to cope with the 500X. And when you consider that the bigger 1.6-litre 120bhp diesel is just as cheap to run, it makes little sense. This 1.6-litre MultiJet is available across the entire range. It’s paired up with a cracking 6-speed manual ‘box and can get you from 0-62 in under 12.0 seconds. A 140bhp 2.0-litre MultiJet diesel engine rounds off the range. It’s as strong as an ox, and is the engine to go for if you’re planning to do a bit of towing. However, it’s only available with the higher spec models and is, therefore, more expensive. The Fiat 500X isn’t the only stylish crossover on the market. Just take a look at the Nissan Juke, for example. But its retro touches and friendly face give it an attractive edge that will appeal to young families. Inside, the seats are comfy, and there is lots of room for everyone. The driver gets to be snug-as-a-bug-in-a-Fiat-rug upfront, but they also get a fab view of the road ahead. The dashboard is dominated by a big, colourful plastic insert that’s spread over the entire length. Entry-level models miss out on a 6.5” colour touchscreen, which isn’t so big a deal at first. But once you see how this screen fills in the blanks on the higher-spec models, you realise that the basic trim looks a tad bare. The materials all look solid enough, and they’re also pleasingly soft to the touch. And despite Fiat’s obsession with everything retro, the controls are also really easy to use. The 500X isn’t what you’d call massive inside. However, if you want an even bigger 500, we’d point you in the direction of the 500L. 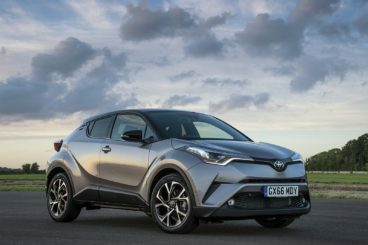 This particular model is aimed at young families who want as much room as a traditional hatchback. And that’s what you get. The boot measures a respectable 350-litres, and can be extended to 1,000 by folding the rear seats. The adjustable boot floor and wide opening make it a usable boot, and it should do for most families. Space upfront and in the back is good, with only exceptionally tall adults likely to grumble. Storage spaces are everywhere, and include a pair of glove box and some hefty door pockets. The entry-level Pop model is a bare-bones model that misses out on a 6.5” touchscreen, as well as most of the engines. It gets air conditioning, but we prefer Pop Star. Part of its standard kit includes climate control, a 5” infotainment screen and front fog lights. It also gets 17” alloys and is our top pick. Standard safety kit is a bit disappointing, as Fiat decided to hold the most useful stuff back for the optional extras list. You’ll have to pay extra for autonomous emergency braking and blind spot assistance. A rear parking camera and lane-keeping assistance are also options. Still, the standard safety kit includes anti-lock brakes and six airbags. Also included is electronic stability control and a tyre-pressure monitoring system. Prices for the new car start out from just over £15,000 and rise to £26,500. For more information on our lease deals, you can check out our page here. In terms of its running costs, the fact that the car uses such up-to-date engines means that costs are kept low. However, if you go for the biggest, 2.0-litre MultiJet diesel engine you’ll need to stretch your budget. It develops a mighty 140bhp, but paired with four-wheel-drive and big alloys, it returns 42.2mpg at best. The turbocharged 1.4-litre MultiAir petrol engine fares better, and can return 47mpg. Coupled with good performance, it’s a solid choice. However, if running costs are a big priority of yours, the 1.6-litre 120bhp MultiJet diesel engine is your best bet. It returns 68.9mpg, and costs just £20 a year in road tax. The 500X looks just as cute as the 500. The only difference is that it’s got a bit more muscle. You need your big cars to handle securely, and this one delivers. Four-wheel-drive is available for extra grip. The base-level model is a bit sparse. Beyond that, models get treated to lots of brand new advanced tech and some attractive colours. There is a reason this crossover is so cheap. While the design is smart, the quality of some of the materials is questionable. The car is comfy enough on smaller wheels. It’s the bigger ones that are the problem. 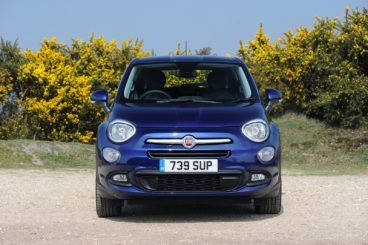 Let’s see how the car fares against its rivals in the comparison section of our Fiat 500X Hatchback review. 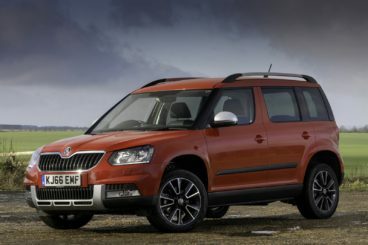 The new Skoda Yeti is a straight-up 4×4 that’s affordable to run, good enough to drive, and practical. The 4×4 variants are capable off-roaders, but they’re also handy on the road. In fact, they’re very “car-like” – composed and entertaining at times. The steering is precise, the gearbox changes effortlessly, and the controls are where you’d expect them. It’s a car that’s comfortable on tarmac and rougher terrain, and it isn’t as tough to drive as you might suspect. The simplest way to get the best out of the Yeti 4×4 is by going for one of the 2.0-litre diesel engines. There are two available, and both are more than capable of providing enough shove. If you’re expecting to be travelling on a full load often, they provide ample power and good economy. A 1.2-litre 108bhp TSI petrol engine will be enough for most buyers, however. It’s not got as much power as the diesels and requires you to work harder. But it’s selling well, and has proven to be a good enough motorway cruiser. You can specify your engine with four-wheel-drive. While doing so will bolster the grip, it will also bump up the running costs. In two-wheel-drive form, the 1.2-litre petrol engine can return fuel economy of 51.4mpg. Road tax is £140 per year. The 2.0-litre TDI 148bhp diesel in four-wheel-drive, meanwhile, is good for 55.4mpg. Inside, what’s immediately apparent is the quality of the car. Build quality is of an especially high standard, while the materials are clearly robust and will last a long time. The dash is reminiscent of the VW Passat, which means the buttons are clearly laid out. Again, they’re all durable and designed to withstand the rigours of family life on the road. Its a boxy interior, and this allows the Yeti to be one of the most practical cars of its kind. The wide dimensions offers swathes of space, and the huge windows create the illusion of even more space. The VarioFlex rear seating system is smart and versatile, and the boot measures 416-litres. It’s one of the biggest in its class, and can be extended to 659 by folding down the rear seats. The new Toyota CHR is a bold-looking offering from the Japanese brand. It looks like it means business. With a top-quality interior and efficient engines, it’s ideal for families who want power and style from their 4×4. For this car, Toyota has employed their Toyota New Global Architecture platform. The idea was that it’d help the CHR cope better with rugged European roads, providing more agility than rivals. And it does. You can get four-wheel drive as an option, but otherwise all models are front-wheel-drive. There is also a hybrid engine available. Yet despite it making up most of the sales, it’s a noisy, unpolished unit that’s at odds with the car’s composed nature. It’s ideal if you’ll be making short journeys, and it’s almost silent when running on just electric power. The 1.2-litre turbo petrol is a better bet if you want more fun. Free from the extra weight of the hybrid’s electric motors and batteries, its steering is more responsive. It’s no surprise that the hybrid engine is cheaper to run, though. It can return fuel economy of 74.3mpg, and is free to tax. However, these numbers are subject to change. Pack your car with bigger wheels, and fuel economy will drop. The 1.2-litre petrol engine, meanwhile, is good for 47.9mpg, and costs £130 a year in road tax. If you’ve stepped foot inside a Toyota before, you’ll have hardly been dazzled! The CHR, though, houses a surprisingly accomplished cabin that knocks spots off all that’s come before it. The overall look is modern and funky, with soft-touch plastics the order of the day. The textures and shapes are well-chosen, and buyers will appreciate the gloss finishes. It feels really upmarket, and it’s nice to see Toyota being so adventurous. And despite the bold styling, this is also a practical interior. A large windscreen and low dashboard mean visibility is good, and you’ve got plenty of seat adjustment up front. Legroom is good in the rear, with the front seats mounted so high that backseat passengers can slip their feet underneath. Headroom is also good, but shoulder room will be limited in the back when there are three occupants. The well-shaped boot, meanwhile, measures 377-litres, and it comes with a low loading lip and wide opening tailgate. 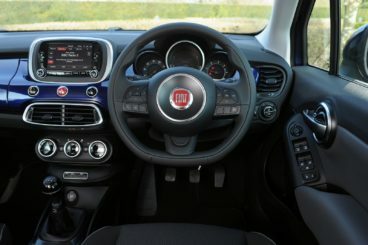 Fiat has done a fab job of transferring the 500’s style cues onto their fun-loving crossover. It’s definitely freshened up the sector. And fortunately, the 500X isn’t just a lifestyle accessory that makes sure you still look good now that you need a bigger car. It’s also got plenty of substance. Practical, good to drive and cheap to run, the new Fiat 500X Hatchback is a smart family car for fashion and cash-conscious buyers.